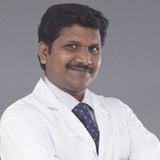 Dr. Agnel Sahayaraja completed his MBBS from Madras Medical College, Chennai, India. He later obtained his MS from MGR Medical University, Tamilnadu, India in 2004. Dr. Agnel worked with National Health Service, UK at various Hospitals in the Orthopaedics Department for 3 years before completing his MRCS training. He also worked as an Assistant Professor responsible for teaching and clinical work with one of India's leading health institutions for 6 years. Dr. Agnel Sahayaraja practices Orthopaedics and specializes in Trauma, Knee joint arthroscopy, Joint Replacement Surgery, General and Paediatric Orthopaedics. He has done basic AO courses in fracture management. His special area of Interests are in Trauma, Knee joint arthroscopy, Joint Replacement surgery, General Orthopaedics. He can speak English, Hindi, Urdu and Tamil.